Construction has always been a favoured tool of the Chinese authorities for stimulating the economy and its development closely reflects that of GDP. The slowdown of China’s economy has resulted in more balanced growth of the sector during the last few years. The government intends to use construction spending as a means to achieve the growth targeted in the 13th Five Year Plan (2016- 2020) or at least to avoid a contraction of the economy. In 2017 the sector accounted for 6.7% of nominal GDP, according to data from the National Bureau of Statistics (NBS). 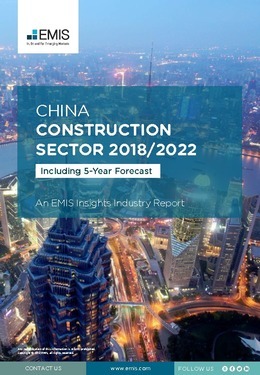 This report provides a complete and detailed analysis of the construction sector for China. EMIS Insights presents in-depth business intelligence in a standard format across countries and regions, providing a balanced mix between analysis and data. Build a clear picture of production and completed constructions for sub-sectors (e.g. residential, non-residential and civil engineering).